﻿ News Bharati - 'Bharat Bhagya Vidhata' in China..!! News Bharati - 'Bharat Bhagya Vidhata' in China..!! 'Bharat Bhagya Vidhata' in China..!! 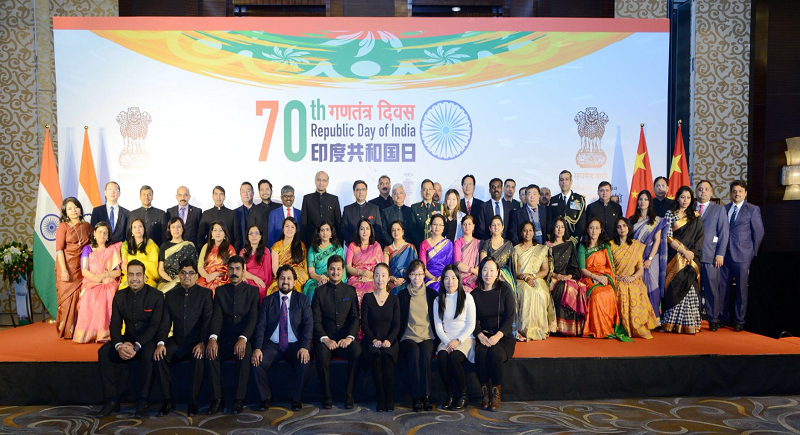 New Delhi, January 28: With the neighbouring nation, China celebrating 70th Republic day of India, the Indian Embassy in China hosted a reception with Ambassador Vikram Misri addressing the gathering of Chinese and foreign guests. Assistant Minister of Foreign Affairs, Mr Zhang Hanhui meanwhile participated as the Chief Guest. “It is a singular honour and privilege for me to welcome all of you here today. I am delighted that you are all able to join us in celebrating the 70thRepublic Day of India. Your presence here this afternoon is a reflection of the goodwill and close bonds of friendship that China and other countries have with India”, he said. Misri also grabbed the opportunity to wish all Chinese friends a joyful and prosperous Chinese New Year! “The year just gone by was a truly momentous one for India-China relations. The Wuhan Informal Summit between Prime Minister Modi and President Xi Jinping in April marked an important milestone in our Closer Development Partnership and was the high point during a year in which our leaders also met on the sidelines of the BRICS, SCO and G-20 Summits. These exchanges set the tone for our ties for much of the year. We also had three Chinese State Councillors visit India in 2018. Minister of National Defence, General Wei Fenghe, and Minister of Public Security, Zhao Kezhi paid official bilateral visits to India. The year was capped by the visit of State Councillor and Foreign Minister Wang Yi to India for the first High Level Meeting on People-to-People and Cultural Exchanges”, he added. “From the Indian side too, there were a number of high-level visits to China for bilateral and multilateral engagements, including those of External Affairs Minister Smt. Sushma Swaraj and Defence Minister Smt. Nirmala Sitharaman. Our National Security Advisor, Shri Ajit Doval, also visited China last November for the Special Representatives’ Talks. The year 2018 has indeed witnessed an all-round expansion in our ties, covering political and economic cooperation, people-to-people exchanges and defence interactions”, he asserted further stressing at the bilateral relations. “Our trade and economic ties with China also witnessed steady growth, with three commercial protocols being signed in the last eight months. In the coming year, we look forward to sustaining the momentum of our robust bilateral ties with China, and further deepen the cultural connect between our two ancient civilizations. At the High Level Meeting in December last year, ten focus areas for furthering these contacts were identified, namely tourism, sports, yoga, traditional medicine, film and television, museums, education, culture, youth and provincial-level exchanges. This provides both our countries with a busy roadmap for the rest of the year”, he signed off.